What to Know When You’ve Gotta Go! Know any kids who are afraid to flush? Or maybe a few with really bad aim? Wish you could help them remember not to drinnk too much water before–uh-oh–naptime? Have no fear, the potty animals from Sycamore Preschool are here to help little ones everywhere be in the know when it’s time to go! FOUR PAWS UP FOR POTTY ANIMALS! Read the Sterling Q & A with me about this book, tips for toilet training, and what it was like sharing a bathroom with 11 brothers and sisters! 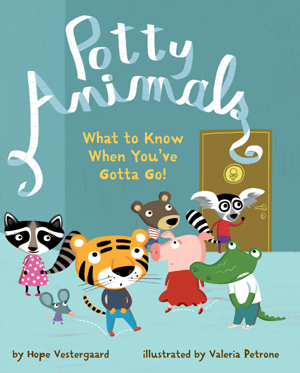 Download a free poster of the Potty Animals chant from the good folks at Sterling Children’s Books.